"Treasures or hells, depend on whether you got it right." The citation above is retrieved from a rhymed folk song related to ancient Feng-shui theory titled “Quick Reference Guide in a Green Bag” 《青囊奧語》 by YANG Yun-song 楊筠松 (834CE to 900CE) during the late Tang 唐 Dynasty . Legend has it that he fled from the capital as an astronomy officer and brought with him the Feng-shui secret which was supposed to be kept within the Forbidden City’s walls. He then made it a living by offering consultation and tutorship in Feng-shiui. He is thus recognized as the Great Grand Master of modern Feng-shui. JIANG Da-hong 蔣大鴻, a government official candidate during the late Ming 明 Dynasty deciphered YANG’s theory and hinted in his book titled “Feng-shui Corrections” 《地理辨正》. Since then the Feng-shui theories evolves but are still mysterious to most of the general public. Based upon JIANG’s work, SHEN Zhu-reng 沈竹礽 of late Qing 清 Dynasty further reveals the secret of Feng-shui to a great details in his book titled “SHEN’s Theory of Xuan-kong Feng-shui” 《沈氏玄空學》, which is then become one the most authoritative book in modern Feng-shui today. However, this book is not easily comprehended by untrained fellows because of its ancient writing styles as well as inadequate explanation to the complexity of the ancient Astronomy and Ji Men Dun-jia therewith. Preserving the structure of the book, Jack Chiu put forward plenty of footnote explanations from “Yi-jing”, “Ji Men Dun-jia”, ancient Chinese Astronomy as well as other Feng-shui thesis, making it easily readable and understandable. So it is called – “The New Interpretation to SHEN’s Theory of Xuan-kong Feng-shui”《沈氏玄空新註》. Starting from the very basic knowledge which is needed for Xuan-kong Feng-shui to the complexity of dealing with Flying Stars, Part I reveals the secret of the fundamental energy theory of Xuan-kong Feng-shui which includes the origin of Sittings and its correction mechanism, the Water Placement Method especially the Castle Gate, as well as the Dipper Method. Highlighting the common errors in Feng-shui, SHEN offers explanation of the way it should be, which includes Imprisonment of Sittings, Control of Evil Energy, Day Picking using Star, etc. Over 71 examples revealed in Part III covering various sittings in both living quarters and tombs. Making it the reference guide of how Feng-shui affects our lives. Collection of Feng-shui articles by SHEN’s followers who further explored the secret of Xuan-kong Feng-shui even down to various sittings. Revealing the impact of the 3 Cycles and the 9 Period in Feng-shui readings as well as useful tips that differentiate you from amateur to professional. Covering articles as far as from the Song 宋 Dynasty to the late Qing 清 Dynasty enabling you to search the truth of Xuan-Kong Feng-shui. 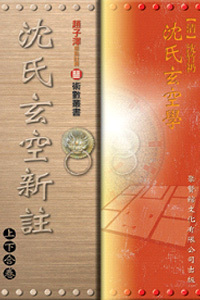 This book is written for those, either amateur or professional, who wants to study Xuan-kong Feng-shui in great details. This book also serves as a great reference book of today’s Xuan-kong Feng-shui.